Demonstrators hold signs and chant in Richmond, Va., on Feb. 2. They were calling for the resignation of Gov. Ralph Northam after a racist photo on his medical school yearbook page came to light. He denies that he is in the photo but admits to once dressing in blackface. Virginia Gov. Ralph Northam is embroiled in controversy for admitting that he wore blackface at a party in the 1980s and for a racist photo on his medical school yearbook page. But the governor, a pediatric neurologist by training, told CBS he isn't resigning, because "Virginia needs someone that can heal. There's no better person to do that than a doctor." NPR spoke with another doctor, Damon Tweedy, about what message it sends to black patients to hear a prominent doctor tell the country that he has worn blackface. Tweedy is the author of Black Man in a White Coat: A Doctor's Reflections on Race and Medicine and is an associate professor of psychiatry at Duke University. The debate in Virginia is only one episode in a long history of racism in medicine, Tweedy says. Many African-Americans may feel distrustful of physicians, stemming in part from the legacy of the infamous Tuskegee syphilis experiment. This distrust has repercussions for the health of black people in America today, who may be less likely to stick with treatments or participate in medical research. Tweedy says he hopes the debate will generate more open conversations about the way bias works its way into the health care system. Our interview has been edited for clarity and length. What's your response to the photo with the guy in blackface and the other guy in Klansman robes in a medical school yearbook? The first thought I had was what that might mean for the patients. One of the problems is that if we just sort of make it all about Gov. Northam, that in some ways kind of misses the point. Someone had to take that photo; someone had to put that into a yearbook. And you think about it, that medical school was in a community that at the time — even now — was 40 percent African-American. What does that mean for those patients, that there's this tacit acceptance of these attitudes about race? And further, 1984 is not that long ago. People are still in practice who trained in 1984. Many of them are the generation that supervised me as I was coming in, training. Lay out for me briefly, what the history of tension is between the American medical community and African-Americans? It dates back to the beginnings of our country, in some ways. The most famous example in modern times is the Tuskegee syphilis experiment, which basically was run by the U.S. Public Health Service and investigated the natural history of syphilis in African-American men. Even after treatment was available, the researchers never notified the men that they had syphilis or that there was treatment available. It was the most egregious example that we know of. But in some ways it follows a much larger history of concerns, not just in the research realm but in the clinical realm. It's very much an oral history among African-American people. You often find that people have a concern or mistrust that they are being experimented upon or that the medical establishment in some way doesn't have their best interest at heart. When you were in medical school back in the '90s, was race ever addressed in the curriculum or in practical training in your residency? During that time there was just starting to be those conversations. Maybe an hour, out of a four-year curriculum, an hour or two. Think about that. I think that a lot of times people think that if you're a doctor, you're very intelligent, you're sophisticated, and somehow you're not as susceptible to these issues of bias and racism in a way that other people might be. I think that's shortsighted. I'm a professor myself, and I've used this recent event as a sort of a teaching opportunity. You know, had discussions with students where we've sort of really openly talked about what do these issues mean. I wonder if you have any advice for Gov. Northam, one doctor to another? I'm not sure how much he might listen to me, but I'm less interested in the idea of him resigning or not. Regardless of what happens there, he does need to find a way to use his story, not out of self-interest but in terms of moving forward the conversation in other medical schools and medical settings. How might someone who thinks that they've been well meaning and educated and all that sort of thing, how might they still have made mistakes that could have potentially harmed people? What are the most glaring racial health disparities you see today in your teaching or in your practice? I'm in psychiatry, personally, but it really transcends every medical specialty. There's been a body of research that shows that these disparities come across in every way because really they derive from society ... from social inequality, economic inequality. That so much drives the kind of care people can receive, where they can receive it, if they can receive it at all. It really cuts across every specialty. Doctors need to learn that they're part of this larger social world. Justine Kenin produced and Selena Simmons-Duffin edited the audio version of this interview. Mara Gordon produced and edited it for web. Virginia Governor Ralph Northam says he is not going anywhere. He's giving interviews on why he is not resigning over a long-ago party to which he admitted wearing blackface and a racist photo in an old yearbook. Here he is on CBS's "Face The Nation." RALPH NORTHAM: Right now, Virginia needs someone that can heal. There's no better person to do that than a doctor. KELLY: No better person than a doctor. Reminder that the governor is a doctor, that that racist photo was from Northam's med school yearbook. Well, this is food for thought for another doctor, Damon Tweedy. He wrote a book a few years ago called "Black Man In A White Coat: A Doctor's Reflections On Race And Medicine." Dr. Tweedy teaches medicine at Duke University, and he joins me now. DAMON TWEEDY: Thank you for having me. KELLY: What's your response to the photograph with the guy in blackface and the other guy in Klansman robes? And it was in a med school yearbook. TWEEDY: Yeah. You know, actually the first thought I had was kind of like what that might mean for the patients. That medical school was in a community that, at the time, even now, is 40 percent African-American. So, you know, what does that mean for those patients that there's sort of these tacit acceptance of these attitudes about race? And what might that've meant for the patients then? And further, 1984 is not that long ago. I mean, people are still in practice who trained in 1984, and so we're not talking about, you know, ancient history. KELLY: For those who aren't familiar, lay out for me briefly what is the history of tension between the American medical community and African-Americans? TWEEDY: It dates back to the beginnings of our country in some ways. The most famous example in sort of modern times is the Tuskegee syphilis experiment, which basically was run by U.S. Public Health Service and, you know, investigated the natural history of syphilis in African-American men. And, you know, even after treatment was available, the researchers never notified the men that they had syphilis or that there was treatment available. So it was, you know, the most egregious kind of example that we know of. But in some ways, it was just - follows a much longer history of concerns not just in the research realm, which is Tuskegee, but also in the clinical realm. There is very much an oral history among African-American people that you often find that people have a concern or mistrust that they are being experimented upon or that the medical establishment in some way doesn't have their best interests at heart. KELLY: And when you were in med school back in the '90s, was race ever addressed in the curriculum or in practical training, in your residency, say? TWEEDY: Pretty limited. I mean, there is - I mean, during that time, there was just starting to be those sort of conversations - maybe like an hour out of a four-year curriculum - hour or two. Think about that. You know, I think a lot of times people think that if you're a doctor, you're very intelligent, you're sophisticated, and somehow, you're not as susceptible to these issues of bias and racism in a way that other people might be. You know, being great in chemistry and physics and biology and getting into medical school doesn't in any way insulate you from all the things that impact society and impact the way that you see people and the biases that you can sort of harbor. So what we're trying to do in medicine now is really work to help people understand their perspectives, how they become informed and how they may impact the kind of care that they deliver to people in the real world. KELLY: Is part of the reason that this has not been a historically central part of med school curriculum that, rightly or wrongly, the hope is that not being racist isn't something that should have to be taught? 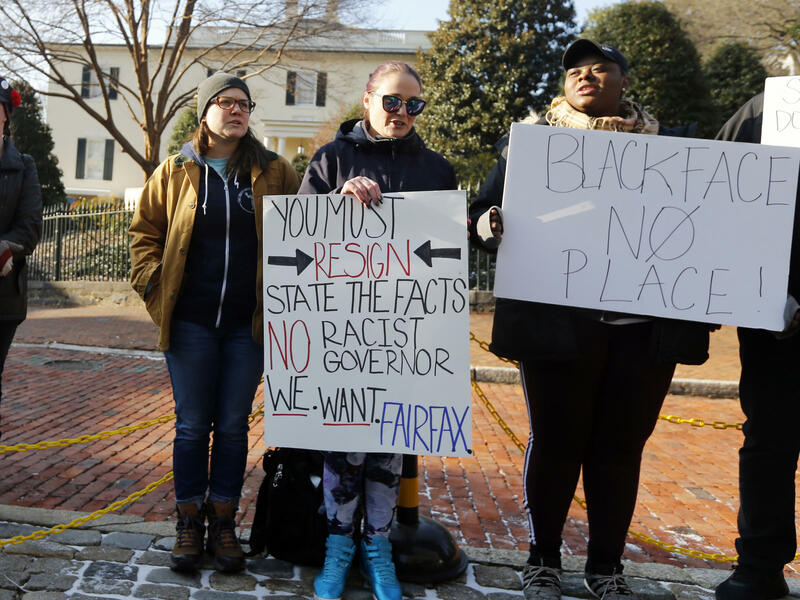 TWEEDY: But I think one danger that we have is that when - even when we use this example of the governor - is that there's this idea of individual - like, individual racism. And is he racist or is he not? And should he resign or not? It sort of obscures the larger context of, like, where he was educated, the experiences of other people around him and how that influences him. Because, of course, people have good and bad qualities, and people will support him and say, no, he's this, that and the other. But that's really - in some ways misses the point. It's much about a much larger discussion about the way our society shapes our ideas and attitudes about race and about class and all these things and how we're impacted by that and how that, in turn, can impact the way that we see people even if we don't intend to, even if we're well-meaning. And so I think that's - we have to sort of interrogate our own biases. I certainly - I mean, I'm a black man, but I certainly have plenty of biases that I've had to address in the way that I see patients throughout my career. And so it's not something that's only specific to white men. I mean, it's everyone. Until we can have that kind of open discussion about it, it's difficult to make progress. But I think we're beginning to sort of slowly break those things down. KELLY: Dr. Damon Tweedy. He teaches medicine at Duke University, and he is the author of "Black Man In A White Coat: A Doctor's Reflections On Race." TWEEDY: Thank you. Transcript provided by NPR, Copyright NPR.